Like this job? Now Like CNNMoney on Facebook for career tips, plus the latest business news and features on Personal Finance, the Economy, Markets, Technology, and more. What they do all day? Many business owners with great products have no idea how to get them out there. Enter the marketing consultant. Companies hire them to set up a plan that generates the right kind of buzz to attract the right kind of customers. How to get the job? A flair for creative promotion runs side by side with a head for analyzing customer data. Expertise in the latest marketing technologies -- web ads, SEO and Google Adwords -- is also key. And most importantly: A savvy consultant needs to be well-versed across a wide range of industries to understand different clients' needs. What makes it great? That wide range of expertise is what makes the job so exciting. Unlike an in-house marketer, a consultant isn't tied to one field. A variety of knowhow creates more opportunities for new accounts. Notes: All pay data from PayScale.com. Median pay is for an experienced worker (at least five or seven years in the field). Top pay represents the 90th percentile. Job growth is estimated for 2010-20, and based on people working in broader 'job family' from the Bureau of Labor Statistics. Do Marketing Consultants have great jobs, or what? Neurosurgeons take home a median $368,000 in salary and bonus annually. 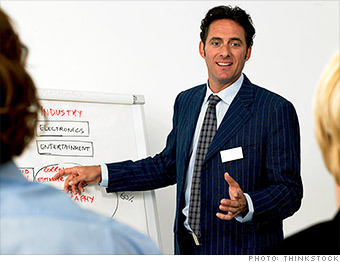 What other Best Jobs in America offer big paychecks?